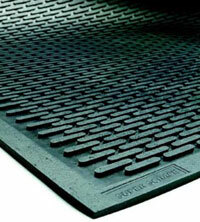 This durable 100% Nitrile Rubber mat provides slide-resistant surface. Ideal for use outside of entrances, in production areas, in kitchens and locker rooms. Surface face cleats effectively scrape tough dirt and grime off feet. 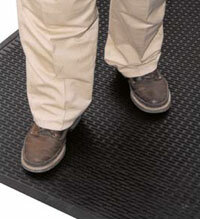 All SuperScrape mats are certified slip resistant by the National Floor Safety Institute. SuperScrape mats also available with safety message, welcome message or custom logo.